Agriculture is a core wealth generation and food security source for any growing economy. With the increase in seed varieties and the demand for natural, high fibre foods, there was a need to adopt a smart farming innovation that enables all Zimbabwean farmers to work more efficiently and get access to all the information they need from wherever they are, directly on the phone. 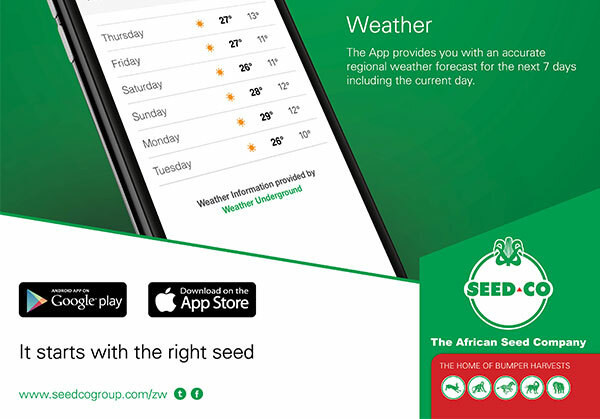 A first of its kind for Zimbabwe, the Seed Co Agronomy app is easily accessible on Google Play Store & Apple Store, it is user-friendly and easy to navigate. The app is very informative, it has all the necessary farming information, from weather updates, depots, farming seasons, crop varieties, fertilizer usage, news and Seed Co sales team personnel in different areas across the country. As a champion for agriculture, we believe in working closely with farmers all over Zimbabwe and with the new Seed Co Agronomy app, we are confident that every farmer will be able to reduce costs, maximize yields, production and profits, and still be extremely efficient.